A dry, peeling face is never pretty. 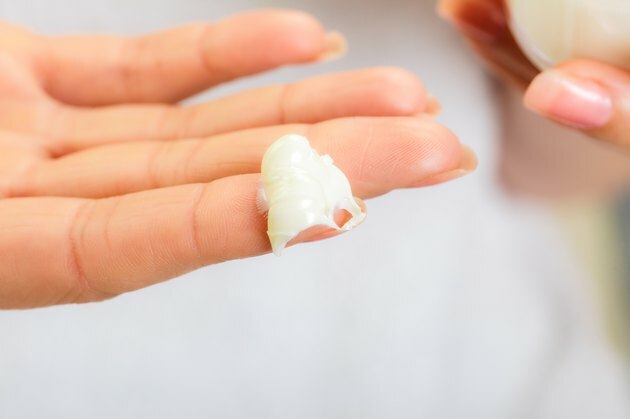 Whether you're peeling from a sunburn or stuck with side effects from windy weather, you definitely don't want to flake on your skin-care routine. Wash away dry flakes with a cleanser featuring gentle exfoliants and moisturizing ingredients. Stick with a strict routine and venture into home-remedy treatment if your require extra soothing. Within a couple days, it'll be smooth sailing on the face front. Wash your face twice daily with a moisturizing facial cleanser. Ingredients that hydrate and smooth out flakes include olive oil, avocado, shea butter and aloe. Place a dollop of cleanser on your fingertips and massage in small circles around your entire face. Rinse with warm water and pat your face dry with a clean towel. It's important to get a cleanser that is noncomedogenic and free of perfumes and dyes that can irritate the skin and dry it out further. Make your own face wash from the ingredients found in your kitchen. Blend together two red-apple slices, 1 1/2 cups of plain yogurt, 1 1/2 tablespoons of olive oil and 1/2 tablespoon of honey. When the consistency is creamy, massage a generous amount in small circles around your entire face for 2 minutes. Rinse with warm water and pat dry. The yogurt acts as a gentle exfoliator for dry skin, while the honey is a humectant that draws the moisture back into your skin. Replace your cleanser every few days with a scrub used to exfoliate your peeling skin. Find one with salicylic acid, which helps rid the epidermis of impurities, stops the peeling and reveals new skin underneath. Other gentle ingredients made to slough off dead skin cells include almond and olive oil, jojoba, grape-seed oil and vitamin E. It's a bonus if your scrub includes glycerin and hyaluronic acid, two ingredients proven to seal in moisture. Make a milk mask that will moisturize and help get rid of your peeling skin, advises New York-based board-certified dermatologist, Dr. Lance H. Brown. Pour milk into a shallow bowl and add some ice cubes. Soak a wash cloth into the milk for about 1 minute. Lay down for 10 minutes with the cloth on your face; rinse with cool water. Brown says the natural lipids in the milk plump up the skin and hydrate the top layer, while the coldness and lactic acid slough off the flakes and helps heel any irritation. Wear a wide-brimmed hat while driving or walking around outside. Make sure your moisturizer contains SPF 30 or else add a sunscreen with zinc to your morning skin-care routine. Refrain from peeling your skin. This can irritate the skin underneath and lead to blotchy, red marks and scarring.